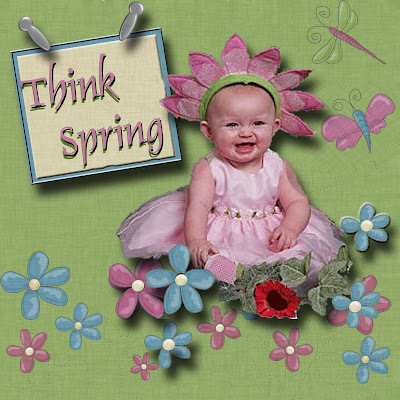 Well, when I got home for work this evening it was digital scrapbooking time for me. From time to time I like to create digital scrapbooking pages to share with family / friend. Here are some pages completed for my Great Niece Justice. Now, keep in mind, I'm a little behind on my pages, these photos were from about 1 years ago. 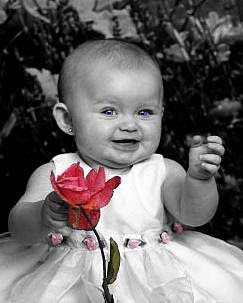 I usually send the pages (after resizing them to a smaller size) to relatives as a surprise or I will do a series of them as .jpg images and then add them to a slide show with music. It puts a little twist on the same old digital photo slide show. Here are the photo pages I did of Justice. Her headband reminded me of spring so that is the theme I went with on two of them. This digital scrapbooking is really starting to take off it seems. 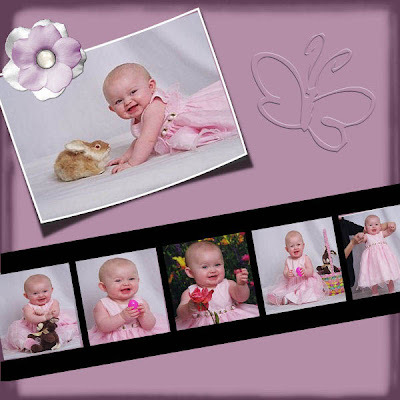 I have done photo montages which I guess are very close to digital scrapbooking. I agree. The only trade off for the space you save in your craftroom buy buying or creating things electronically is the hard space you need for these pages.